Hosted by Lisa Swifka. Visit the event blog here. This year I will give away two items, one on this blog and the other can bee seen here. 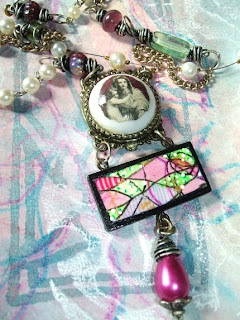 Anyone with an active blog can enter to win this mixed media necklace. All you have to do is leave a comment on this post along with your email address so I can contact you if you win. The event runs from Jan 19 thru Feb 12, 2009. I will pick a winner on Feb 12 at ten pm Arizona moutant standard time. Good luck to all persons leaving a comment. Click here to see more of my jewlery designs. NOTE: I lost eight posts but I was able to enter your names in the drawing. You may click on comments to see the names listed. DO NOT FORGET TO LEAVE YOUR EMAIL ADDRESS ON THE COMMENT PLEASE. Look for the ONE WORLD ONE HEART 2009 giveaway. Check this this blog and my other blog to see what items I will be giving away. Details will be posted on or after January 19, 2009. This is a demo painting of a wet pour using watercolor, ink, and acrylic...no collage this time. 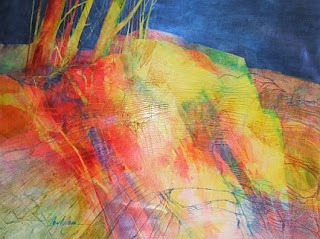 This and other methods will be taught at the Fort Collins, Colorado workshops beginning in March 2009.